As the prison warden in the movie “Cool Hand Luke” once said, “What we have here is a failure to communicate.” But in this case, that applied to the understanding Nets coach Lionel Hollins and his players had about what was supposed to happen in the final seconds of a 104-98 loss to Miami and the brilliant Dwyane Wade Wednesday night at Barclays Center. 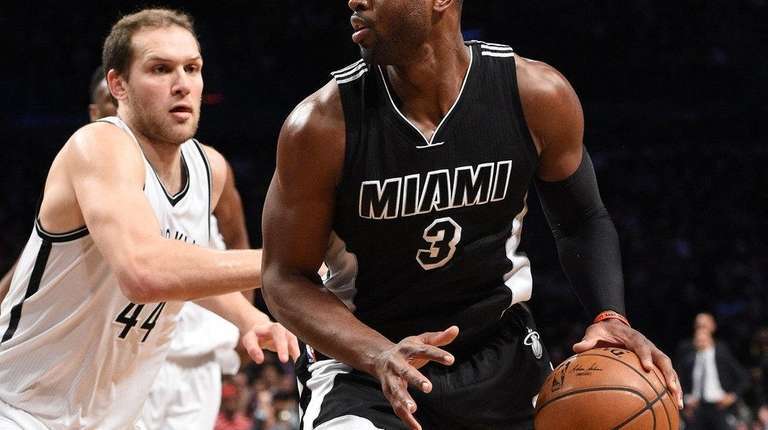 The Nets had no defense for Wade, who scored 28 points and shot 13-for-17, including 10 points in the final period. And they had no defense for their failure to foul when they trailed by five points and allowed the Heat to run about 25 seconds off the clock before a missed shot gave Brooklyn the ball with 11.7 seconds remaining. Miami gained a 103-98 lead when Wade hit a runner down the left side of the lane with 43.5 seconds left. The Heat got the ball back after Thaddeus Young missed under the basket with 36.9 seconds to go. As Wade slowly dribbled upcourt, the Nets retreated. Bojan Bogdanovic looked toward Hollins three times as if expecting a signal to foul, but Hollins just stared until Goran Dragic missed a three-pointer and the Nets got the rebound and called timeout with 11.7 seconds left. There’s no guarantee fouling would have altered the outcome, but it certainly would have created more possession time for the Nets. They had cut an 11-point third-quarter deficit to 87-85 midway in the fourth. Then Wade returned to the game to score six points in a 10-2 burst that pushed it to 97-87. Wade was supported by center Hassan Whiteside with 20 points and 13 rebounds and Dragic with 16 points. It was the third straight loss for the Nets, who were led by Brook Lopez with 25 points and got a 22-point, 10-assist performance by Jack. But Lopez got only two shots and three points in the final period when Heat coach Erik Spoelstra double-teamed him and forced the Nets to find alternate offense.